Deception Island, known as one of the world's safest harbors, is a volcanic caldera (a volcano that collapses into itself, making for an unusual crater). The island is "deceptive" because it can be entered only through a 7.5-mile-wide breach in the caldera. 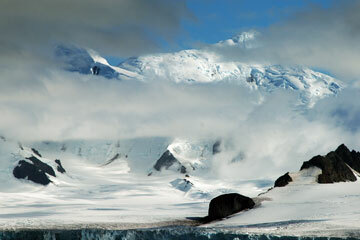 Deception Island's volcano is dormant and last erupted in 1970. The island is part of the South Shetland Islands. Part I » ON a five-week cruise to three countries, amateur photographer Daniel Kinoshita captured the dramatic landscape of Antarctica, the coldest, windiest, driest continent in the world. In the first of a two-part presentation of Kinoshita's icy trip in January, we feature shots of Antarctica Sound, located on the northern tip of the Antarctica Peninsula; the Gerlach Strait, the passageway between the Antarctica Peninsula and the Anvers and Brabant, two island groups; Deception Island, a volcanic caldera; and Halfmoon Island, named for its crescent-moon shape. 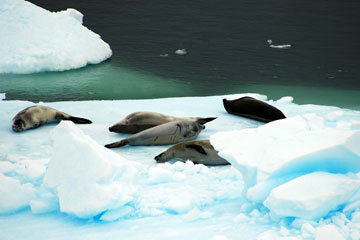 More photos from Antarctica next Monday. 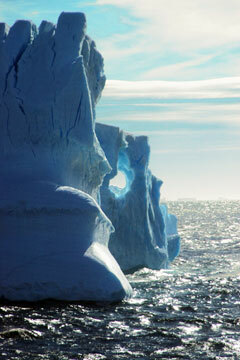 Antarctica Sound is nicknamed "Iceberg Alley." Kinoshita says cruising through these waters is like watching a parade, as hundreds of icebergs of all shapes and sizes go floating serenely by. Sea lions relax along the Gerlach Strait. 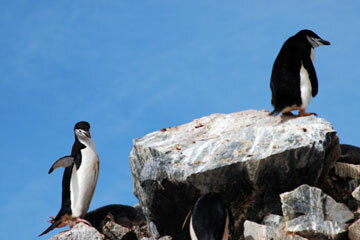 Members of a large colony of chinstrap penguins make house at Halfmoon Island. The penguins usually have two chicks each summer, and, unlike most penguins, feed each chick equally rather than favoring the stronger of the two.